For positioning my CNC engraver, I have chosen acme screws. I am using 3/8-12 standard acme rod; I do not think that a precision acme is need for engraving, as long as the nut is an anti-backlash design. 3/8 inch is the largest diameter that I can hold in my lathe when machining the rod ends. The two nut halves are acetal. They are preloaded at 10 lbf by a spring, and are rotationally locked by axial pins. Acetal allows running without grease lubrication, which would collect the fine dust produced by engraving. If the coefficient of friction of acetal to steel is 0.1, then the efficiency of a simple 3/8-12 acme nut is 44%. Pushing 10 lbf then requires 4.8 in-oz torque. But this is not a simple nut; one half is resisting the load and the other half is aiding. Overall, the required torque might be 2 or 3 times as much. And, the thrust bearing will provide resisting torque. So I have chosen NEMA 17 stepper motors with ample torque reserve. Here are parts of the thrust and radial bearing assembly (l to r): the radial bearing stator, radial bearing rotor and thrust flange (pinned to acetal runner), stationary thrust plate, acetal thrust runner and spring guide, spring, and shaft clamp. The brass flange backing the first thrust runner will bond to the acme screw with Loctite retainer 609. The shaft clamp at the far right is acme threaded. 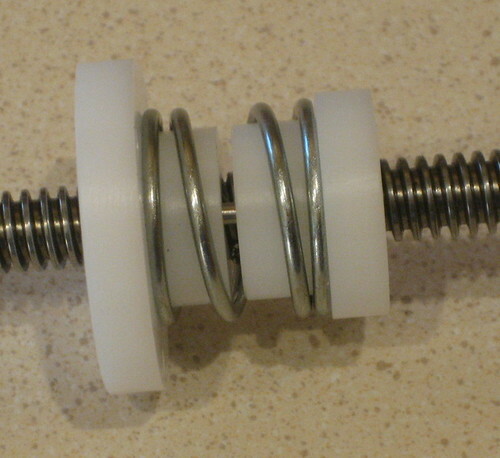 It allows adjustment of the preload spring. Here are supports (aluminum) for the thrust assembly and the nut. Finally, the complete actuator assembly. What kind of software do you plan on using for CNC controller, and for creating G Code? I am thinking about the KFLOP motion controller from Dynomotion. This makes sense for me, as I have written a lot of C code. KFLOP also has a G code interpreter, and all software comes with the board. To generate engraving designs, I am thinking about Cut2D from Vectric.